A new Sugar Factory American Brasserie has opened on the Vegas Strip in the Fashion Show Mall. The two-story dining attraction spans 22,000 square feet and the décor features a floor-to-ceiling candy dot wall; candy bins highlighting more than 500 types of candy; a Moulin Rouge marquee; and on the second level, a "candyland" themed 14-seat horse-drawn carousel surrounded by 5,000 light-up candy flowers, oversize cupcakes, lollipops and animal sculptures that overlook views of the Strip. The menu lists items such as crêpes, salads, monster burgers, milkshakes, pizzas and desserts like the King Kong sundae serving up to 12 people with 24 scoops of ice cream and the “Chocolate Gold” fondue. Drinks include chocolate-based martinis and cocktails. Sugar Factory is open for breakfast, lunch, brunch on Saturday and Sunday, and dinner. Sugar Factory American Brasserie, Fashion Show Mall, 3200 Las Vegas Blvd. S., Ste. 1240, Las Vegas, NV 89109, 702-685-0483. B&B Ristorante at Restaurant Row at The Venetian has debuted an “Early Spring” seasonal tasting menu. Priced at $99, the menu includes grilled local asparagus with chicken stock-based sauce thickened with egg yolk, pecorino and Parmesan; hand-cut tagliatelle with house-cured pancetta, braised artichokes, white wine, lemon, pecorino and parsley; ravioli filled with English pea and mint purée, with pecorino and cream served in a sauce of merguez sausage with tomato sauce; house-made ricotta with eggs and baked Parmigiano topped with confit of green garlic; and sorrel-infused panna cotta with honey and Sicilian pistachio syrup. An optional wine pairing is available for an additional $99 per person. B&B Ristorante, The Venetian, 3355 Las Vegas Blvd. S., Las Vegas, NV 89109, 702-266-9977. SUSHISAMBA at The Palazzo is now offering the Japanese Whisky Experience, a seven-course pairing of Japanese whiskey. The dinner begins with a Wagyu Cocktail infused with A5 Wagyu, maple syrup and salted caramel. Among the following courses are a Passionfruit Whisky Sour matched with crispy tempura sweet oyster with osetra caviar; Akashi Single Malt 5-year Sherry Cask paired with whisky-soy marinated robata grilled pork ribs with aji panca barbecue sauce and A5 Wagyu roll with sherry bourbon truffle sauce; and Japanese Cherry Manhattan Granita matched with dark roasted coffee custard, chocolate hazelnut crumble, sweet cream ice cream and Japanese whisky foam. The dinner must be reserved 48 hours in advance so ingredients can be procured and the cost is $250 per person. In addition, one of the pairings is rotated weekly on the regular menu. SUSHISAMBA, The Palazzo Resort Hotel Casino, The Shoppes at The Palazzo, 3327 Las Vegas Blvd. S., Las Vegas, NV 89109, 702-607-0700. After opening and helming L'Atelier de Joël Robuchon at MGM Grand Hotel & Casino since 2005, executive chef Steve Benjamin is leaving the restaurant and moving on to launch the new Waldorf Astoria Beverly Hills. MGM Resorts International has stated that his last day will be April 18, 2017. No replacement has yet been named. L'Atelier de Joël Robuchon, MGM Grand Hotel & Casino, 3799 Las Vegas Blvd. S., Las Vegas, NV 89109, 702-891-7358. Japonais at The Mirage has closed, after being open for more than a decade. The fate of the restaurant had long been in doubt, as it was rumored it would be replaced by Morimoto, which instead opened at MGM Grand earlier this year. Japonais is replaced by Otoro, which takes its name from the fattiest, most prized cut of tuna belly. The executive chef of the new restaurant is Fernando Sposato, who previously was executive chef of Blue Ribbon Sushi Bar & Grill at The Cosmopolitan and recently took on the executive chef position at Japonais. The robata grill that was in use at Japonais will continue to be utilized in the new concept, and chef Sposato’s rock shrimp tempura, Chilean sea bass and sushi menu items will be available. 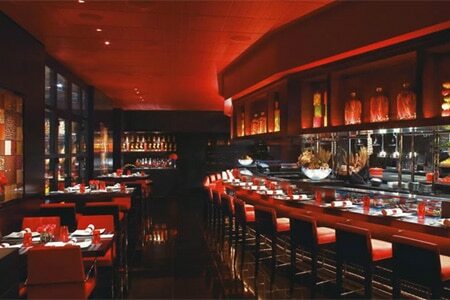 Japonais, The Mirage, 3400 S. Las Vegas Blvd., Las Vegas, NV 89109, 702-791-7111. J.C. Irish Sports Pub at JW Marriott Las Vegas Resort, Spa & Golf closed on March 20, 2017. Antiques, etched glass, wood and stone that replicate Ireland’s pubs adorned the authentic eatery, which was built outside Dublin by the renowned Irish Pub Company and assembled here. J.C. Irish Sports Pub, JW Marriott Las Vegas Resort, Spa & Golf, 221 N. Rampart Blvd., Las Vegas, NV 89145, no phone.